“This is not a political poem” and I would like to read it again!!!! Born and raised on the sub-urban streets of Lagos, Efe Paul Azino has evolved a poetry uniquely his own. His poems are welcomed in the realm of academia and acclaimed on the streets. Widely regarded as one of Nigeria’s leading Spoken Word Poets, Efe Paul has been a headline performer in many of the nation’s premier performance poetry venues, including Anthill 2.0 and Taruwa. For over a decade, Efe has continued to deliver Spoken Word Poetry locally and internationally, gracing platforms at seminars, workshops, conferences, tertiary institutions, community development fora, as well as churches. 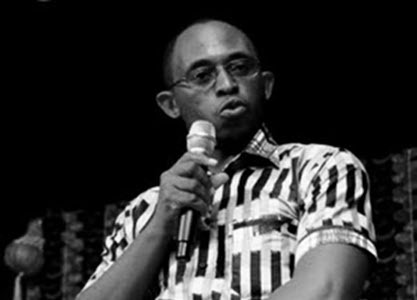 A one-time member of the Editorial Board of The Effective Manager Monthly, pioneer Editor of Mageuzi Magazine and Next Generation, a monthly Newspaper dedicated to raising youth awareness on socio-economic and political issues, Efe Paul is a vital contributor to national discourse and his essays are featured in national and international dailies and journals. A curious student of life, his readings and learning span various disciplines. The voice of a generation, a seeker and speaker of truth, an entertaining poet and performer, Efe Paul leads a generation of poets in successfully lifting poetry off the printed page, out of the shadows of academia and making it accessible to the people.